Holiday season is in full swing! I mostly know this because my pockets are screaming. Holidays are expensive, and if you’re on a budget like this graduate student is, then you’re probably looking for some budget-friendly, yet high-quality gifts for that special do-it-yourselfer in your life (or, let’s face it, you’re probably also looking for yourself – I know I sure am). 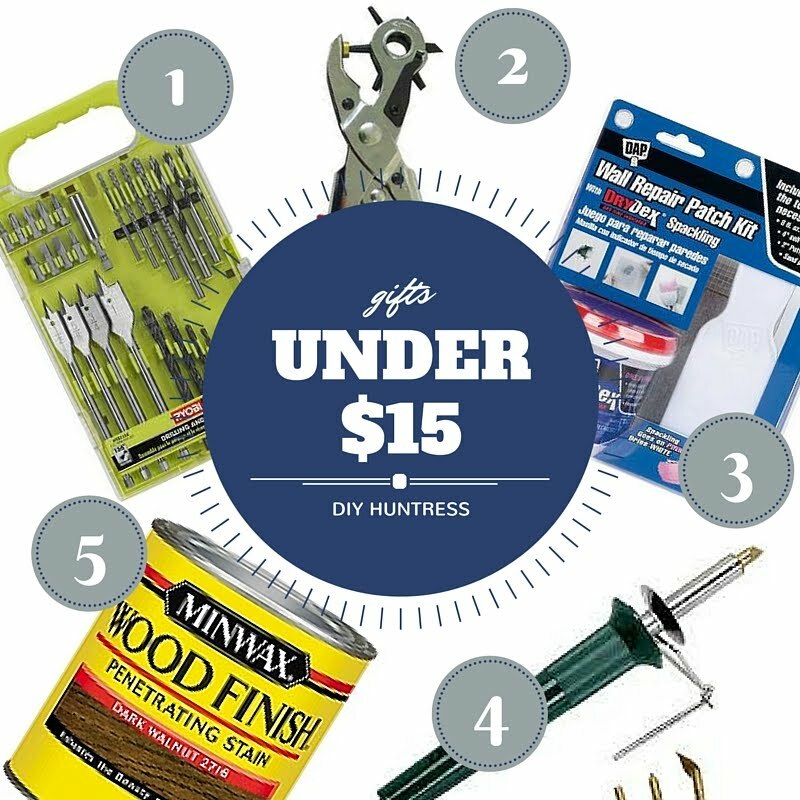 So, whether you need a great gift for a loved one (or yourself… I’m not judging), here’s a list of some of my favorite DIY products and tools that are under $50! Here’s how it works. I’ve separated these 15 products into three categories (“Under $15”, “Under $25”, and “Under $50”). Each photo has a numbered product – to find the product you like, just click on the name of the item, which will be numbered and listed below the photo. Easy, right? Now, let’s get started! 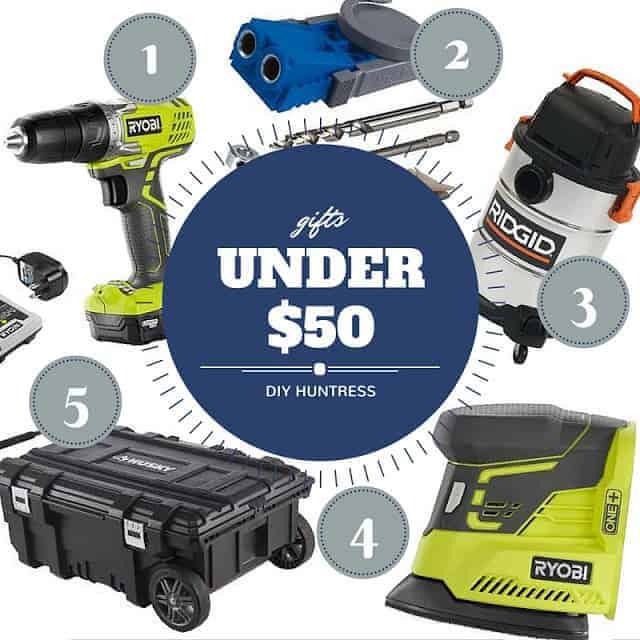 If you’re a DIY’er, or know someone who is, then you or they most likely have a cool drill (if not, you can scroll down below for an awesomely affordable option in the “Under $50” category). Therefore, an awesome gift to give would be this crazy cool kit filled with every type of bit needed to complete basic projects around the house… and for $9.97!? This one’s a no-brainer. I cannot stress how awesome this tool is. Leather hole punches are a great tool to have for many reasons. They can be used to create adjustable leather straps for furniture, leather bracelets, and they come in handy when your favorite belt no longer fits (I blame Thanksgiving). You can get your hands on one for right under $9.00 on Amazon (disclaimer: the link to this product is an affiliate link). This… is… awesome. Wood burning pens are great for customizing those cool wood pieces that were hand built (or hand bought) by that DIY’er in your life. They make an awesome stocking stuffer and can be found for as little as $10.49 (disclaimer: the link to this product is an affiliate link). Don’t want to order one on Amazon? Visit your local craft store! Last, but not least, Miniwax is my go-to stocking stuffer for my friends and family who do lots of woodworking projects. This stuff rocks. The finishes and sealers come in tons of colors and can be purchased in cute little cans. The smaller cans start at about $8 per can… which means you can splurge on a few fun colors for that special someone! Hate painting your house because your back gives out every time you reach for the paint can? Well, Wagner has your back (hah). This awesome roller holds your paint in the shaft and feeds the roller as you paint. Therefore, eliminating the need for a paint tray all together! It’s pretty fricken’ awesome… If I have you sold yet, you can find it at Home Depot for right under $25! OKAY. For the record, I am OBSESSED with this stuff. Burnishing paste is used for woodworking projects as a sealer (and sometimes stain). I’ve used it on a few projects including my DIY Football Serving Trays, and it has made it 100% possible to wash my woodworks in the sink with soap and water, all while keeping a beautiful rich color. I have a serious crush on this stuff, and you HAVE to get your hands on it. The DIY’er in your life will love you forever. You can find 8 oz. jars on their site for $20.99, and they really last a long time. If you or your loved one is someone who works around tools all day, then you know how taxing the noise can be on your ears. RYOBI made these awesome earphones, which help mute the clings, clangs, and roars of machinery, while also allowing you to chat on the phone with your best friend. They can be found at Home Depot for $19.97. I mean, hey, for that price, you can even use them to mute your kids, or the noisy traveler on your commute to the city… why not? Saw Horses are a great tool to have around the house. They allow for mobile work stations and sometimes even make cute table legs. For whatever reasons it is that you may need one, you can purchase this cool steel version for around $18. You’ll be glad you got one… trust me. If you follow me on Instagram and Facebook, then you already know how obsessive I am about organization. This awesome organizer contains 10 compartments to store small items such as screws, nails, washers, and maybe some touch up nail polish (that could just be me). The inner bins are also removable, so you don’t have to carry the case with you everywhere you go. With a name like Milwaukee, you also know it’s sturdy and dependable. Pick one up at your local Home Depot for $19.97. 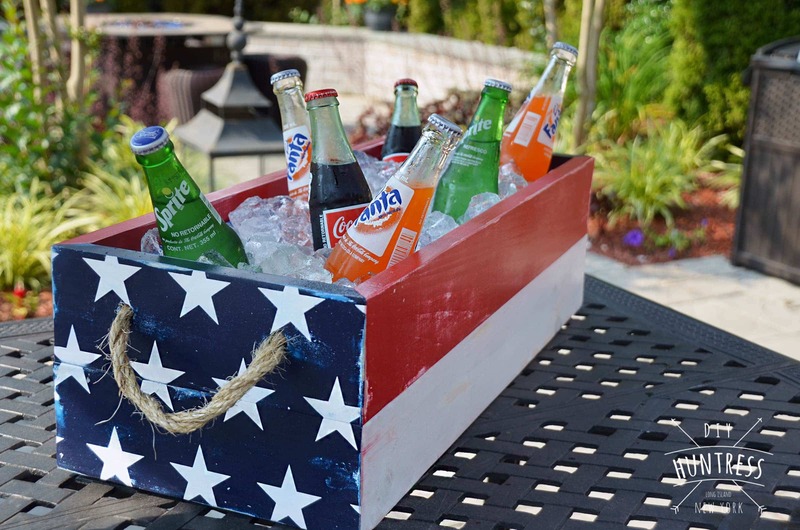 Any DIY’er will thank you for it. I know you guys were waiting for this one… there was no way I could make a gift giving list without recommending one of my favorite tools. I can’t say enough good things about this drill, and for right under $50 ($49.97), it makes an awesome gift for any DIY’er. Partner it with the RYOBI 31-Piece Drive and Drill suggested in the “Under $15” category, and you just made someone very happy for a long, long time. Anyone who builds furniture… or basically any type of wood structure, should have one of these in their arsenal. The jig can be clamped to the angles of a project to help guide angled screw holes for tightly securing two pieces of wood. It also helps conceal the holes when filled after building. There are many different Kreg systems available, but at right under $40, this one takes the cake if you’re on a tight budget. Unless you like the taste of sawdust and debris, you should probably get your hands on one of these bad boys. The 6 gallon shop vac makes for easy cleanup and is simple to wheel around any shop, garage, or shed (in my case). This vac is right under $50. Last on this list is an awesomely mobile tool chest from Husky. The reason I chose this job box over others is that it makes my favorite past time, organizing, a breeze. The 25 gallon box has compartments for tool storage, tracks to hold 2x4s, and allows you to charge your phone on the inside while working. Did I also mention that it’s waterproof? Cause that’s a big help. Any DIY’er would benefit from this tool chest, so definitely give it a shot. It’s worth every penny of the $49.97 price tag. Phew… that was a lot of information. But, there you have it! 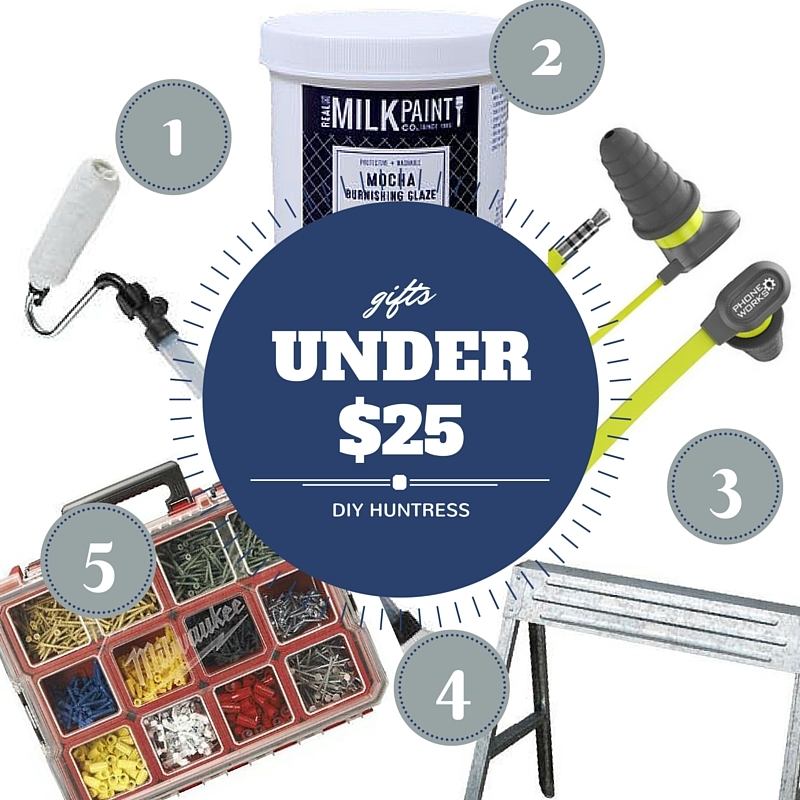 A list of 15 gifts for DIY’ers, under $50! I know lots of you have asked for a post like this, so I hope this helped! Love the recommendations, but looking to spend some more money? Check out my friend Frank’s blog over at Glued-N-Screwed for his kicka** list of gifts in the upper price ranges. 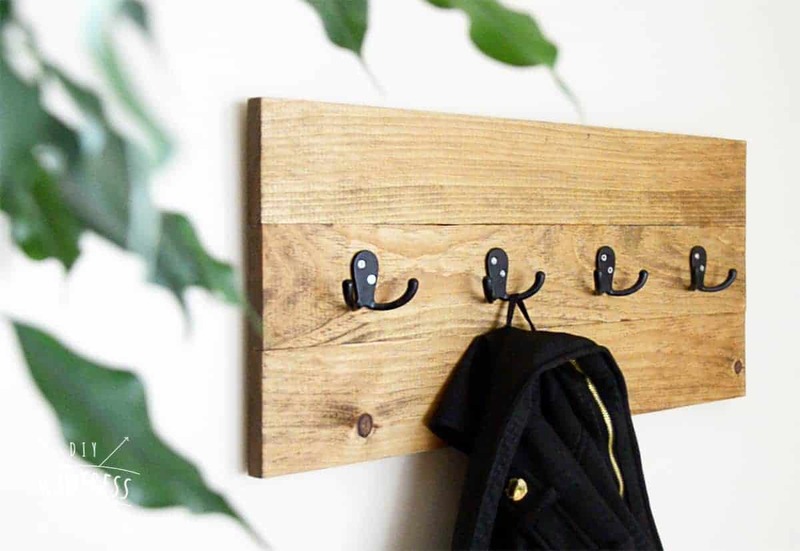 There are lots of awesome things there that the DIY’er in your life will go crazy for.